Anything you pay attention to in your classroom will inevitably increase. It truly is as simple as that. The human perception focuses on things we expect. This is why verbalizing your positive expectations in the classroom will make a difference. As a teacher you are externalizing your values and beliefs while you teach, i.e. communicate with your students. So, if you expect students to hate learning…. well… that is what you will get. And vice versa, if you expect every student being capable for learning and submitting good quality work, that is what you will get (sooner or later- be patient). Focusing your communication on what you want to happen in your classroom creates the expectation for students. I am talking about the subtexts of the classrooms anywhere, on any level of education. There are ancient and new studies about this issue, one of my favourites being the Pygmalion Effect, of course. And I know already visited this issue in the post about Hidden Expectations, but I wanted to focus more on communication here, and emphasize its effects on learning. Or, not learning. Every teacher knows how it is not only important what you say, but also how you say it and the non-verbal communication accompanying your message. These three are commonly referred to as verbal, paraverbal and non-verbal messages, and the emphasis of each of them changes a bit depending on the age of your students. The younger the student, the more emphasis you need to put on the para-and non-verbal messages. Often this is expressed with a triangle showing a small portion on the tip being the verbal communication, and the other two being the over 90% majority of what children actually receive. For more mature students the verbal message is stronger, but the other two parts of your message still remain important. But there is actually more to that. Your classroom practices must match with your communication. If your words (and expressions) are being positive but the undertone strongly negative, students will be following the latter. Having practices that promote initiative, autonomy and student accountability strengthen your positive messages in the classroom, and also strengthen students’ understanding about their own learning process – which of course makes giving positive feedback even easier. Creating positive spirals in classroom is easy! It is also a choice each and every teacher has to make. It starts from stating positive expectations to your students, and then making sure your classroom practices match with your words. What do you want your focus to be? The Path of All Learning – How we move from Observation to Action. Such a nice way of visualizing how learning happens! The amount of information (or the data) around us is bigger than ever, and the internet provides us with more and more data all the time. One important role for an effective teacher is to help students make good choices while searching data (and information). It may not be obvious for students what a reliable source looks like, so it is essential to teach about source criticism. I would also communicate early and often the fact that the knowledge two students construct from the same piece of information is different. How could we lead more students to the path of learning? Making good choices seems to come naturally for some students while others need some coaching in order to become successful learners and be able to navigate with more ease within the educational systems. By allowing choices we also communicate our confidence in our students as learners – it is about letting them know we believe they can do it, without necessarily saying it aloud. There are things in the classroom that must be done without getting into negotiations about how and why, and we truly cannot let students rule and do whatever they please in the classroom. However, allowing certain amount of choosing makes it emotionally easier for students to agree with the mandatory things. But this is not the only benefit of teaching how to choose. Only through our own choices we create accountability for our own learning and also train our executive functioning. Learning to make good choices is a skill to learn and it highly contributes to our higher level thinking. We should not deny that opportunity from our students by having too rigid rules that allow no choices. How to add more choices into your classroom? During a regular day we have many opportunities to allow choices, starting from choosing whom to work with. By asking students to choose a partner who can help them in this assignment you are also encouraging students to recognize the good study habits of others. Giving younger students a package of content to be learned by the end of this week communicates your trust in their ability to choose the best pace for their own learning, and providing a timeline about how big fraction of the content should be finished by each day helps them understand the percentages, too. By letting students choose which assignment they want to start with helps them understand their personal preferences. Also, having a strong structure in the assignments allows the content to be more individualized. I think the ways of introducing more choices in learning environments are virtually infinite, if there is the will to make the change to happen. My personal credo about best teacher being the one who makes herself unnecessary by empowering students become autonomous learners carries my values within it. I believe, that only by allowing students practice making good choices in an emotionally safe learning environment where their opinions or beliefs are never ridiculed, we can help the next generation reach their full potential and become critical thinkers. There is no shortcut to wisdom. Imagine a wheel, like a bicycle wheel. What would the ride feel like if there were bumps on the wheel? Yet that is how we tend to emphasize only one aspect of learning and teaching in our classrooms. Finding a balance is not always easy. After all, we have so very many details to include to our daily classroom teaching that it is sometimes hard to keep our thoughts straight. Here is a very simple 1-2-3 tool for checking the balance. It covers the most important areas of classroom teaching, no matter what level or grade you are working with. 1. Co-operate. Provide emotional support in the classroom. It helps your students learn, because they feel safe and more comfortable (read Mazlow if you don’t believe just my words). Be aware of learning problems, as well as the social ones, and address them in timely manner. Emotionally safe learning environment is the first premise for good quality teaching. 2. Be constructive. Create or adapt a classroom management system which is compatible with your own values and ideas about good teaching. Having extremely clear expectations for students cuts down the need of behaviour management – when student know what they are supposed to be doing creates lots of opportunities for the teacher to compliment them for their dedication and participation. Maximize the learning time by providing autonomous learning choices after finishing a task. 3. Strengthen the cognitive learning. Cater for concept development by asking lots of open ended questions and teaching your students ask those questions, too. Make sure to stop to listen to the answers. Provide feedback during the learning process instead of evaluating only the end result. This is the most important single thing enhancing their learning. Only those mistakes that are allowed to be corrected can help students learn more. These steps also empower your students to move towards autonomous learning, because they focus more on learning than on teaching. And that is how it should be. 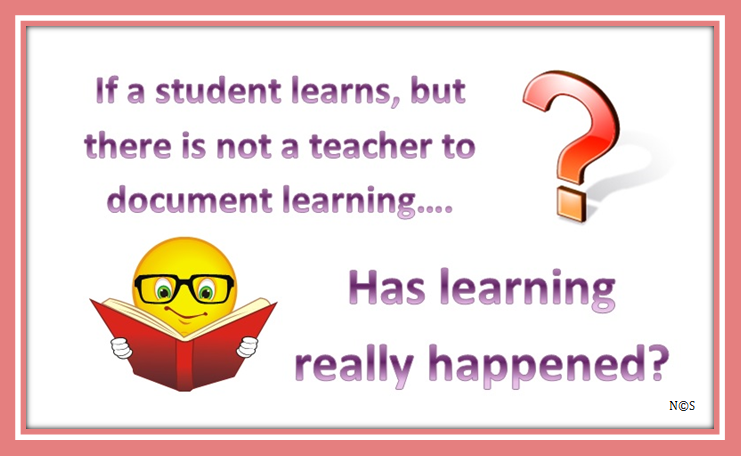 After all, we are in the classroom to help our students learn, are we not? And one part of helping could be providing them a bit smoother ride. Teaching is such a wonderful profession! We are trusted with great responsibility. Teachers all want to positively affect the lives of the students they teach. However, being a teacher is not always easy. Learning and teaching are two different things. They are two different processes that are often put into the same frame of reference (education) and sometimes even happen in the same physical space (classroom). If learning is seen as an in-built force within your students, the teacher’s job just became much easier in an instant. By remaining as a facilitator for learning and letting the students build their own knowledge, the teacher has taken a huge step towards utilizing the learner’s autonomy. Students are led into the learning process and given freedom to choose (within pedagogically appropriate boundaries) how to construct their own knowledge and which learning activities to use in order to reach the mutually discussed learning goals (of the day or week – teacher should take responsibility for the larger goals). Ideally students are also allowed to choose the evaluation methods they feel being most suitable for their needs, but the teacher should lead the students utilize wide selection of assessment. In the previously described learning environment learning is authentic, builds on higher level of thinking skills, new information becomes part of the students thinking process and the learning objective is comprehended as a part belonging to a bigger entity. Thinking from the viewpoint of teaching things appears to be very different. It seems inevitable that the teacher must somehow capture and keep the attention of the students. So, in order to get and keep the attention the teacher must motivate the students to learn and probably even entertain them so that they will want to continue learning. Small rewards (and penalties) are utilized to focus students’ concentration into the desired learning objective, and students are led through a teaching procedure with the hope that it would change also there thinking and not just their behavior. I can help teachers achieve high academic standards and provide tools for you to make learning and teaching more effective and enjoyable. Send Nina a message and learn more. And click here to find Nina’s Notes about teaching and learning. I hope you enjoy! The key is teacher’s desire to empower her/his students to learn autonomously. Ultimately this makes the teacher become unnecessary. Of course, first you must convince your students that you are not a threat to them, but an ally. Empowerment makes students want to learn. You can call it reverse psychology, or just avoiding the reactions of students when they are told to do things they might prefer not doing. Ultimately it is about teaching accountability, and doing things because they need to be done, not because someone tells me to. There is also a cognitive aspect in empowerment: unleashing your students intellectual curiosity. Helping and guiding students in their learning process is a non-threatening way to assess their learning, too. We all have different approaches to learning, and evaluating the process rather than the product gives much more information about how your students are advancing. The constructive part of empowerment is helping your students make well informed choices every day. Small and big choices, but both equally justified – because it helps us understand why we do certain things. The important thing is to reflect back to previous experiences and build on the understanding we gained there. After all, we all helping our students to construct their own view of the world we live in. Your life – your world – your choices. I wish all students were empowered to know that!